Why does the Art Department love Town School? 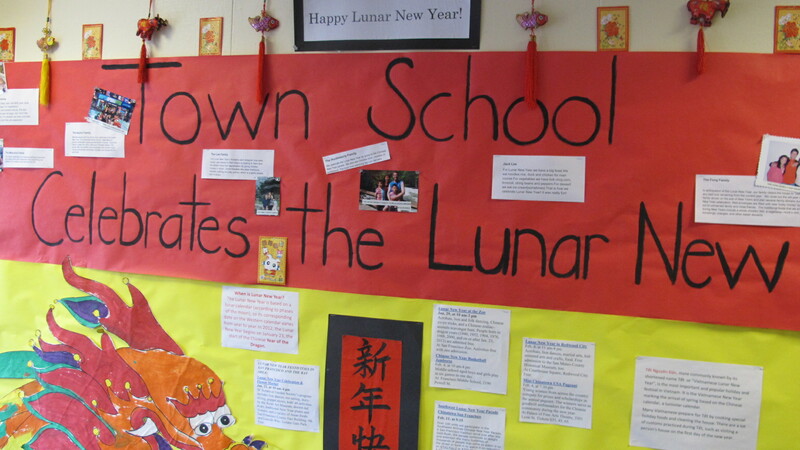 ….A Chinese New Year Story by Lauren Menschel. Sometimes trying new things means taking risks. February 10th, was the conclusion of a new project which had felt like a big risk. On that culminating day, after weeks of hard work, 1st graders celebrated the Lunar New Year with a Chinese Lion Dance performance. The grandiose costumes, drum banging, and lion stomping were all student-made and performed having lots of fun. One of the great things about Town School is how our community rallies behind good new ideas and makes it safe to take risks. At times we (the art department and 1st grade teachers) wondered if we had bitten off more than we could chew. In the end, it was the Town community at large which made it successful. It’s amazing to think the number of people who lent a hand: parents who helped during art class, PE teachers who gave up their class time for practices, a music teacher who lent her instruments, encouragement and video recording by administration, an 8th grade student who recommended a Kung Fu master as a guest teacher, teachers in different grades who offered their expertise with music and costumes … the list goes on. It’s a toss up, in my mind, what was the most fulfilling part of this project. Was it the proud smiles of the boys’ faces on performance day? Was it the fun of experiencing a colorful and lively Chinese tradition? Or maybe, the best part was the satisfaction of taking a risk with an amazing group of people and feeling part of a team.